A view along the planned pedestrian walkway designed by AECOM. Greenpoint and Williamsburg waterfront advocates recently celebrated two small, but pivotal, victories in a decades-long battle for walkways along the East River in North Brooklyn and 28 acres of waterfront parkland that were promised but never delivered by the Bloomberg administration’s 2005 rezoning. Both victories could signal an important turn by Mayor Bill de Blasio toward community control and could restore a slight measure of confidence in the citywide rezoning process currently underway. 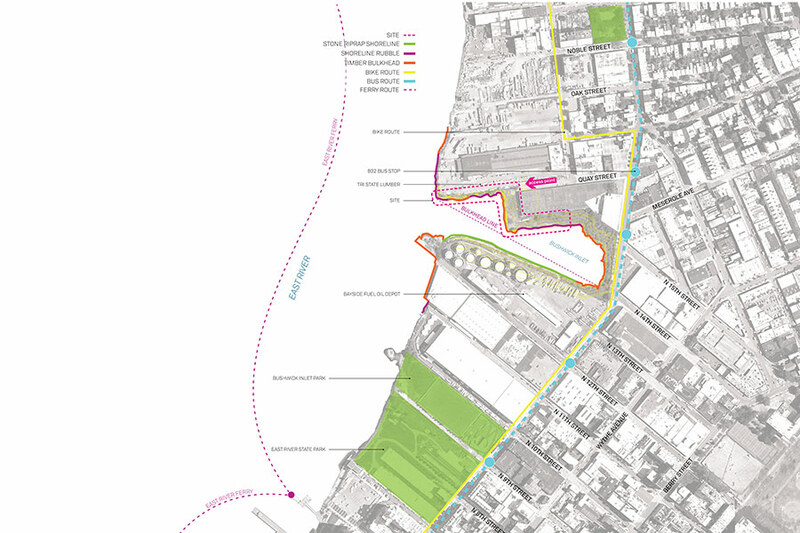 Most remarkably, AECOM’s incorporation of FEMA-recommended flood levels, a terraced amphitheater bluff, and a living shoreline into plans for the Greenpoint Monitor Museum waterfront are evidence of the penetration of resilient design into every corner of New York City’s shoreline. 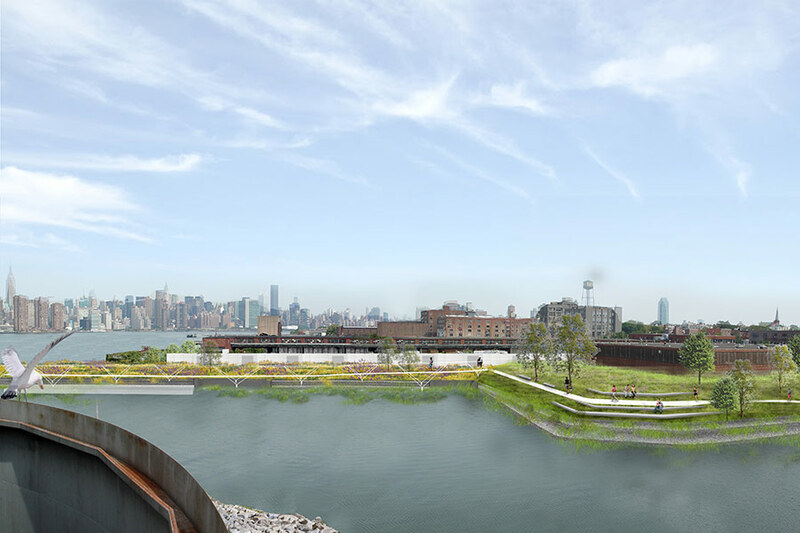 The district’s residents spurred the first victory last fall when they voted to award $599,200 of the $19.5 million Greenpoint Community Environmental Fund (GCEF) to the Greenpoint Monitor Museum’s visionary waterfront design and permitting project. AECOM’s Gonzalo Cruz, a Harvard Graduate School of Design alumnus who directs the firm’s Urban Design and Landscape Architecture studio, prepared the support materials, leading the conceptual design pro bono. The project, dedicated to honoring the pioneering Civil War battleship manufactured there, its engineer John Ericsson, and Greenpoint patriots who fought to preserve the Union, presented a unique opportunity. To protect the land from erosion and to create a natural habitat, a living shoreline wraps the edge of the site with plantings of cordgrass, sea lavender, switchgrass, black needlerush, glasswort, and groundsel bush. An ecological walkway and scenic overlook loft above, providing a continuous public right-of-way that ties into the 2005 zoning resolution. 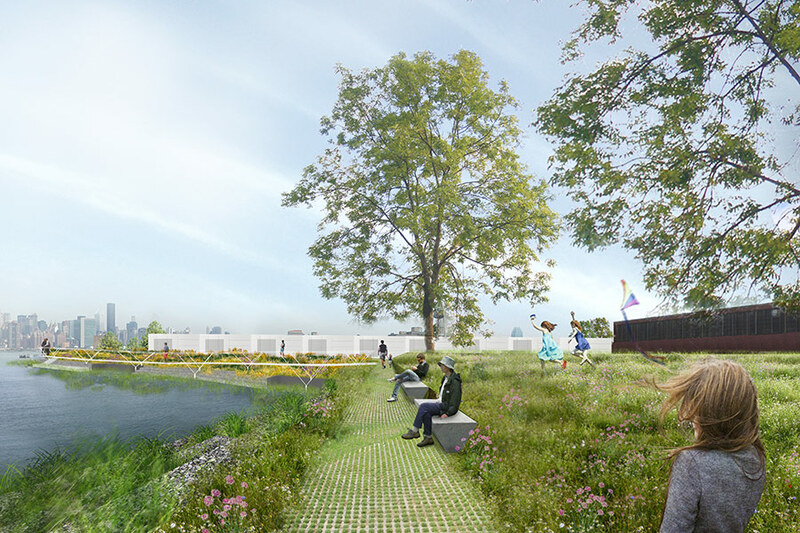 During Hurricane Sandy in 2012, Bushwick Inlet flooded five blocks inland, so the team designed a tiered amphitheater facing the Manhattan skyline that ascends 12 feet above sea level, with berms that reinforce the upper edge, softened by a retaining lawn featuring educational displays about engineering and history. At the top, Cruz reserved a section of the site for the future Greenpoint Monitor Museum. The GCEF award acted as a signal for the city government to eliminate the threat of eminent domain that has dogged the nonprofit since the 2005 rezoning clumsily designated its property as part of the anticipated 28-acre Bushwick Inlet Park. The Greenpoint Monitor Museum gained title to the one-acre parcel along the Bushwick Inlet in 2003 but has been unable to effectively fundraise with the threat hanging over it. Meanwhile, the Bloomberg and de Blasio administrations neglected to acquire the other parcels designated for parkland before rezoning caused land values to explode. With the GCEF grant and AECOM’s design moving to the next phase, the Greenpoint Monitor Museum project is now embarrassingly far ahead of the city’s barely preconceptual zoning diagrams. In December, Brooklyn Borough President Eric Adams and Mayor de Blasio’s spokesman publicly affirmed for the first time that they would not support the use of eminent domain on the site. Meanwhile, the battle for the rest of Bushwick Inlet continues: The Friends of Bushwick Inlet Park has been organizing regular street actions and protests aimed at pushing the city to acquire an 11-acre parcel for the park where the CitiStorage building burned down last January in a suspicious fire. Activists predicted a real-estate development would soon follow; six months later, Midtown Equities and East End Capital signed an option to purchase the land, floating the offer to build a section of the park in exchange for a variance to add residential units. Related Companies reportedly joined talks to provide capital; the developers could already build up to 600,000 feet of as-of-right commercial space. In late December, waterfront activists scored another important victory: A de Blasio spokesman affirmed in Crain’s New York Business, “The administration would never accept a rezoning here that did not have the support of the councilman and community.” CitiStorage is the last section of the now 27-acre Bushwick Inlet Park remaining to be acquired; activists say legislation sitting in a State Senate committee in Albany would use eminent domain to force its sale.